Action from Peterborough Sports' win over Welwyn. Sports are in blue. Photo: James Richardson. Two games, two wins and two clean sheets - but manager Jimmy Dean insists the best is still to come from Peterborough Sports. The city team have launched their debut Southern League Division One Central campaign in fine style, following up a 1-0 win in a Saturday opener at Berkhamsted with a 2-0 home triumph against highly-fancied Welwyn Garden City on Tuesday night. Lewis Hilliard grabbed the only goal in the curtain-raiser, but then missed the victory against Welwyn which was earned by Josh McCammon’s first Sports strike and an own goal. Dean said: “Starting the season with two wins is very pleasing, but there is a lot more to come. “We played well in the first half at Berkhamsted and only had one goal to show for it when we could easily have been three or four up, but we didn’t come out in the same way in the second half and that was disappointing to see. “Tuesday night was a bit of a reverse as we started a little slowly, gradually got on top and produced a really good performance in the second half. Sports now face a mouth-watering FA Cup preliminary round clash at Stamford tomorrow (August 25). The Daniels have also made a great start with back-to-back Northern Premier League Division One East wins. “It’s going to be a real test against Stamford,” added Dean. “It’s a derby game and has the makings of a great cup tie. “We know we’re not going to win the FA Cup, but we’re like everyone else in that we’d like to have a decent run in it as it can really create interest and build the fanbase. Sports then go to Yaxley for a Bank Holiday Monday league derby providing neither team is involved in an FA Cup replay. Yaxley are at Daventry in their FA Cup tie tomorrow. They’ve started their league programme with a 4-1 win over Barton Rovers and a 3-0 defeat at title fancies Bedford. 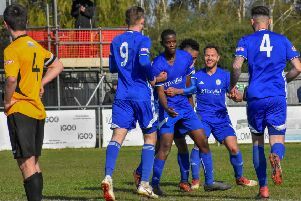 Deeping Rangers represent the local United Counties League clubs in the FA Cup tomorrow and their reward for a win over Holbeach United in the last round is a cracker of a contest against AFC Rushden & Diamonds at the Haydon Whitham Stadium on Saturday (3pm). Higher level Diamonds are one of the best supported clubs in the region so a bumper crowd is expected for the preliminary round tie. Preliminary Round: Daventry Town v Yaxley, Deeping Rangers v AFC Rushden & Diamonds, Spalding Utd v Wellingborough Town, Stamford v Peterborough Sports, Northampton Sileby Rangers v Wisbech Town. Division One: Bourne Town v Birstall United, Huntingdon Town v Raunds Town.